Dream Pod 9: Varis Hopper (VTOL Aircraft) Available Now! The Varis Hopper (VTOL Aircraft) for the Southern and NuCoal factions is now in production. The kit is now available for to order on the Dream Pod 9 Online Store. We sent off copies of the Varis and Dragonfly Hoppers to our great friend and former Gold Gear Painting Competition Winner, Agis Neugebauer, over in Germany to get painted up. We received them back at the office this afternoon and took the time to snap a few photos, with both hoppers and a Hunter and Command Jager gear beside them for scale. They turned out great, a big thank you to Agis for getting them painted up so fast. Hoppers are being added into the new edition of Heavy Gear Blitz, which is currently in development, you can download the Alpha Rules and join in the playtesting. The Varis Hopper also includes the new sales option we started with Dragonfly Hopper and Hoplite APC Custom Packs. When you purchase a Varis, Dragonfly or Hoplite at the regular price there is now an Available Options section below the price. The options allow you to add a 2nd, 3rd, or 4th miniature at a special price each, effectively allowing you to create your own package deal price when ordering up to 4 of the same miniature at once. You just need to check the box for each option you want added. Here is a direct link to the Varis Hopper's order page which has parts and additional photos of the Varis from different angles. 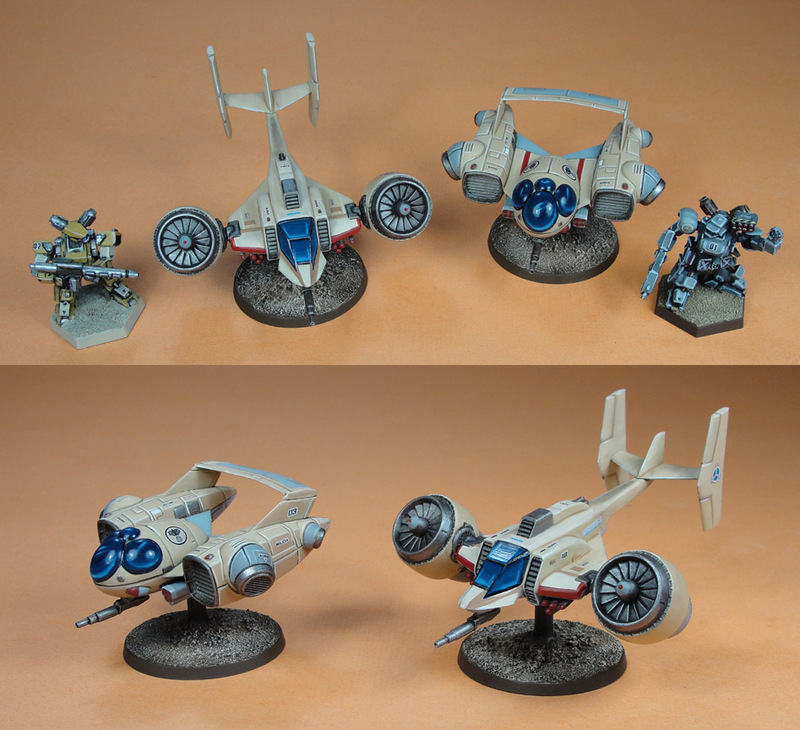 Home › Blogs › Robert Dubois's blog › Varis Hopper (VTOL Aircraft) Available Now!